Any trip that starts off with champagne is a good trip. Sunwing Airlines agrees with this sentiment and has had the wisdom to provide a “Champagne Service” to all sun destinations. 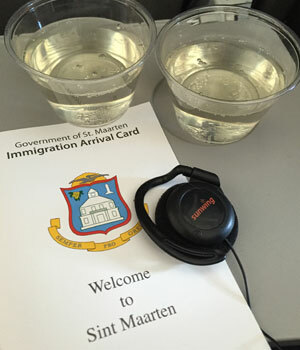 We decided this nice little perk helped tremendously in getting passengers into the holiday spirit, especially if you are lucky enough to be served TWO glasses of champagne. We indulged. With its champagne service, and complimentary bistro meals accompanied with wine, Sunwing gets high marks for providing perks when most airlines seem to be looking for new and inventive ways to part customers from their cash. Sunwing Airlines understands the importance of maintaining a level of good service for their passengers, they even allow checked bags up to 20 kg at no extra cost. Imagine that! Previously a Radisson Blu, Riu recently purchased this small, luxury resort and has been busy renovating it to meet the high standard set for all Riu vacation properties worldwide. The resort was officially opened to visitors last year, complete with new and improved restaurant options, a humongous infinity pool, and updated accommodations. The approach to Riu Palace is undeniably spectacular. With steep climbs up and down a tiny, twisty mountain road, the drive delivers jaw-dropping views. An idyllic scene is laid out far below, a perfect Caribbean snapshot of white sand beaches and aquamarine water nestled in between two lush green mountains. 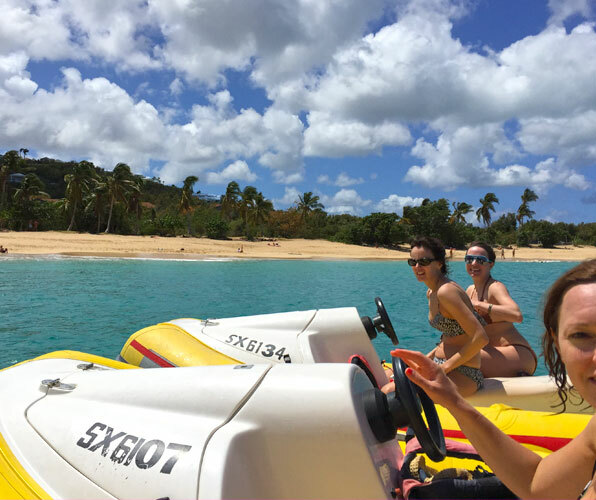 As you make your way to Anse Marcel you realize just how private this tiny cove is, with only the Riu Palace and a couple of other, much smaller, resorts guaranteeing guests an experience of true relaxation in this little St. Martin hideaway. The gorgeous plantation style hotel shows well. Its extensive gardens, nicely decorated restaurants and virtually private beachfront give guests a luxurious vacation experience at a reasonable cost. The warm family-like atmosphere, and fun beach bar social scene, makes it evident that the resort works hard to keep all guests happy and entertained. Our favorite thing at Riu? Hmmm, so hard to chose! We loved hanging out in the new infinity pool, the free in-room mini-bar was pretty awesome, and the spa treatments were so very lovely, but the food was the big winner for us. Homemade, hot donuts, platters full of wonderfully presented seafood, and we especially loved the POTS of delicious coffee and warm milk delivered promptly to our table in the morning. Plus, the resort offers guests the option of dining in style at three full service restaurants, Krystal Fusion, La Mer and L’Ile Steakhouse. 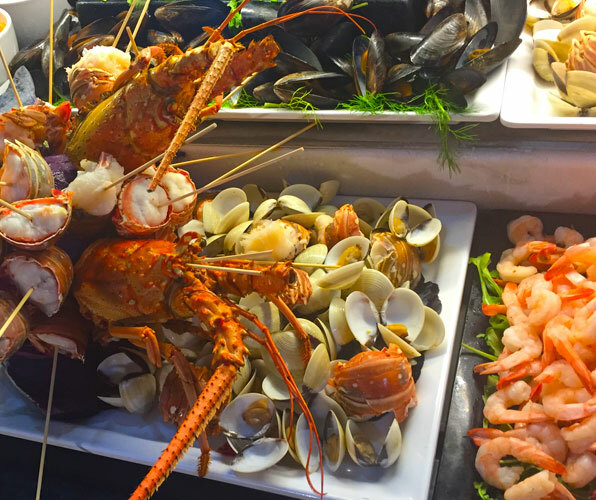 We felt that the Riu Palace offered a delicious selection of quality and fresh menu and buffet items not often found in all-inclusive resorts. The only drawback to having access to all of this beautiful food is that you eat too much of it! We highly recommend renting a car while in St. Martin. The small island is easy to navigate and having access to a car allows you to fully explore the great activities available, both on the French and Dutch side of the island. Here’s our list of top things to do in St. Martin. This tour was booked through NEXUS Tours and it was hands down awesome! What can be more fun than bopping along the island coastline in your very own watercraft? The small yellow boats go lickety split, so we recommend this tour for older kids and adults who are not prone to seasickness. The two and a half hour trip takes riders to the tiny Lovers Beach, which is only big enough for two occupants, you then weave your way through a few marinas where you can get a close up view of some of the world’s most luxurious yachts. 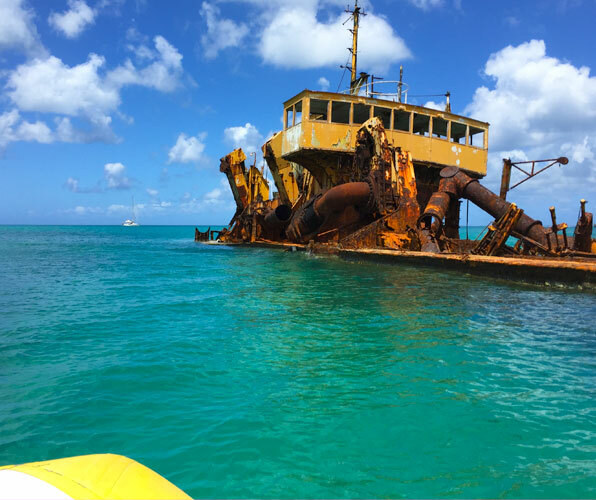 After speeding along the coast, and being tossed around on the ocean waves, the tour stops at Creole Rock for about a half an hour of snorkeling. The best part of the tour? The sheer exhilaration of being on a tiny, speedy boat in a big blue ocean, in the Caribbean, too cool! Our Rhino Safari tip: Arrive wearing your bathing suit and a cover-up. The changing facilities at the location are minimal. The lovely little town of Philipsburg on the Dutch side of the island is our first choice for shopping and latte drinking in St. Maarten/St. Martin. You’ll find a huge selection of shops, from higher end lines (Cartier, Benetton) on Front Street to tiny craft stalls tucked away in the side streets of Philipsburg. Be sure to stop at the Guavaberry Emporium to sample their huge selection of hot sauces, rum and liquors. Our Philipsburg tip: Wander down Old Street while you’re in town. This sweet, tiny street has a great selection of craft, chocolate shops and cafes, making it a perfect place to sit, sip a latte and relax after a busy afternoon of shopping. 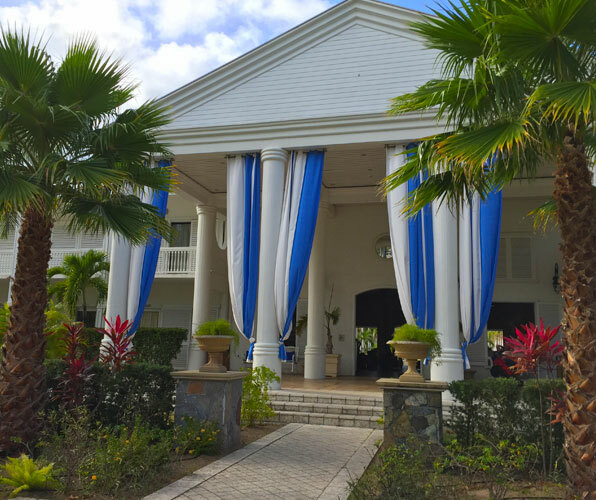 The village of Grand Case is about a 10 minute drive from the Riu Palace Resort and it is a must visit for any foodie vacation to St. Martin. We fell in love with the Lolo’s found on the waterfront in Grand Case. Lolo shacks have been around forever in St. Martin’s. They are the island’s version of local food featuring a mouth-watering selection of BBQ meats, and a generous selection of sides, mac and cheese, rice and beans, salad, broccoli, spaghetti, potato salad, and coleslaw. Within a few minutes of ordering you’ll receive an enormous plate of yummy, lick your fingers BBQ and sides, all for about 10 to 15 dollars. 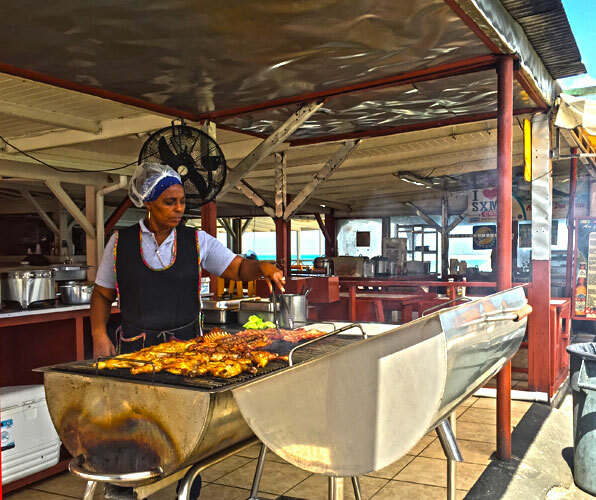 Grand Case has become the gourmet capital of the Caribbean, and the Lolo BBQ joints, as delicious as they are, are not the only food option in town. The village boasts a dizzying selection of fine dining restaurants; our top spots for gourmet are La Villa, and La Cottage. We like the prixe fixe option available at La Villa, for a grand total of $49, you get an appetizer, main course and dessert. The Mahi-mahi with upside down sweet potato pie at La Villa was so very yummy! Our Grand Case tip: bring cash, the Lolo’s don’t do credit or debit. Maho Beach is a perfect place for a short stop and a drink in St. Martin. Join the throngs of jet gazers on the beach patio and watch in awe as enormous planes roar by just meters above the beach. Our Maho Beach tip: be sure to check the schedule of daily flights listed on a surfboard by the beach (just look for the pirate statue). Knowing when flights are coming in makes it easier to get into a prime photo op position for the big boys arriving on a daily basis.